If you’ve got a large family and want to take a fabulous holiday altogether, you’ll need a great big holiday cottage! We have an excellent range of properties that can sleep up to 15 people including grand Georgian houses, rural barn conversions, country estates and seaside townhouses. All of these bigger holiday homes offer plenty of space for a large family gathering. Our large properties are also ideal for a Suffolk getaway with friends. 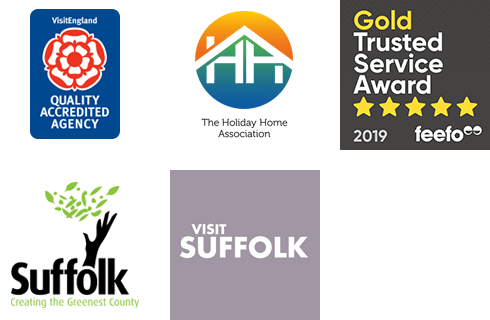 Whether you want to take a relaxing coastal holiday discovering the great outdoors or prefer to explore some of Suffolk's charming country villages and bustling market towns , we’re sure we’ll be able to find you a large holiday cottage that’s just right for you! We appreciate that it's sometimes difficult to find one large property that suits everyone in your group, that's why we've selected some neighbouring properties that offer a great alternative if you want to holiday with a group but have your own personal space. Thalassa is a beautiful property just a stone's throw from Aldeburgh High Street and the beach offering a touch of luxury to a Suffolk holiday. Limosa presents the perfect opportunity for families and friends to come together to experience treasured memories in this wonderful bungalow with a secluded garden and ensuites to all four bedrooms . A stones throw from the High Street, the famous fish and chip shop and beachfront, with off street parking for two cars. Sailor's Retreat is a real gem! In the popular village of Reydon, only a stone's throw from the coastal town of Southwold, this is the perfect holiday home for any family or group of friends wanting a touch of luxury during their Suffolk break.